The Johns Hopkins University, founded in 1876, is a private institution of higher learning located in Baltimore, Maryland, United States. Johns Hopkins offers its main undergraduate and graduate programs at the Homewood campus in Baltimore and maintains full-time campuses in greater Maryland, Washington, D.C., Italy, and China. Johns Hopkins was the first university in the United States to emphasize research, applying the German university model developed by Wilhelm von Humboldt and Friedrich Schleiermacher. The Johns Hopkins University is named for Johns Hopkins, who left $7 million in his 1867 incorporation papers and 1873 will for the foundation of the university and Johns Hopkins Hospital. At the time, this was the largest philanthropic bequest in U.S. history, the equivalent of over $131 million in the year 2006. Hopkins is no stranger to significant monetary gifts; in 2001, Sidney Kimmel, founder and chairman of Jones Apparel Group, donated $150 million for cancer research. Though Kimmel’s gift is the largest single gift in the university’s history, alumnus Michael Bloomberg's confirmed personal donations total over $200 million. Bloomberg, whose first donation of $5 was given in 1964, the year he graduated with a degree in electrical engineering, is the largest individual benefactor in the university's history. The university opened on February 22, 1876, with the stated goal of "The encouragement of research... and the advancement of individual scholars, who by their excellence will advance the sciences they pursue, and the society where they dwell. "The university's first president was Daniel Coit Gilman. Its motto in Latin is Veritas vos liberabit – "The truth shall make you free." The undergraduate student population at Hopkins was all male until 1970 although many graduate programs were integrated earlier. Johns Hopkins was the first American research university,and the first American university to teach through seminars, instead of solely through lectures. The university was the first in America to offer an undergraduate major (as opposed to a purely liberal arts curriculum) and the first American university to grant doctoral degrees. 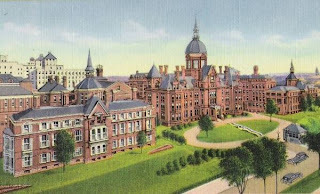 Johns Hopkins was a model for most large research universities in the United States, particularly the University of Chicago. Johns Hopkins is particularly regarded for its hospital and schools of medicine, public health, and international studies. The Johns Hopkins Hospital was ranked as the top hospital in the United States for the seventeenth year in a row by the U.S. News and World Report annual ranking of American hospitals. For medical research, U.S. News ranked the School of Medicine second nationally and School of Public Health first nationally for 2007, and, in an August 2005 study, the School of Advanced International Studies (SAIS) was ranked as the top master's program in international relations. 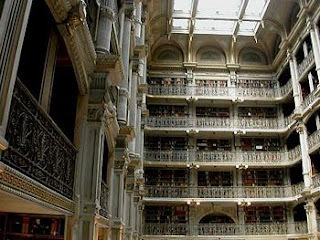 The original main university campus was in downtown Baltimore City. However, this location did not permit room for growth and the trustees began to look for a place to move. Eventually, they would relocate to the estate of Charles Carroll of Carrollton and Homewood House, a wedding gift from Charles to his son Charles Jr. 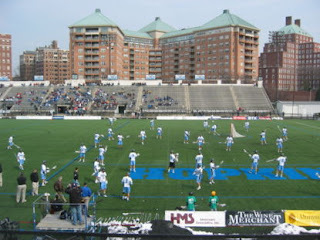 The park-like main campus of Johns Hopkins, Homewood, is set on 140 acres (0.57 km²) in the northern part of Baltimore. The architecture was modeled after the Georgian-inspired Federalist style of Homewood House. Most newer buildings resemble this style, being built of red brick with white marble trim, but lack the details. Homewood House was later used for administrative offices but now is preserved as a museum. Zanvyl Krieger School of Arts and Sciences: Located at the university’s Homewood campus, the Krieger School is the core institution of the university and offers undergraduate and graduate programs,[with more than 60 undergraduate majors and minors and more than 40 full-time and part-time graduate programs. 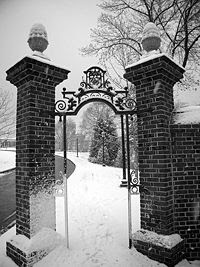 G.W.C Whiting School of Engineering: The Whiting School is located on the main Homewood campus of the Johns Hopkins University in Baltimore, Maryland, and offers undergraduate and graduate engineering programs. School of Education: The School of Education was established in 2007, incorporating divisions of the former School of Professional Studies in Business and Education. School of Medicine: The School of Medicine is headquartered at the university's Medical Institutions campus in East Baltimore with Johns Hopkins Hospital. The School of Medicine is widely regarded as one of the best medical schools and biomedical research institutes in the world. Peabody Institute: founded in 1857, is the oldest continuously active music conservatory in the United States. Located in Baltimore's Mount Vernon neighborhood, it became a division of Johns Hopkins in 1977. The Conservatory retains its own student body and grants its own degrees in musicology, though both Hopkins and Peabody students may take courses at both institutions. Johns Hopkins' Washington, DC campus located near Dupont Circle is home to the Paul H. Nitze School of Advanced International Studies and the part-time graduate program Advanced Academic Programs (AAP). SAIS is devoted to international studies, particularly international relations, diplomacy, and economics. Applied Physics Laboratory: The university operates the Applied Physics Laboratory (APL) in Laurel, Maryland, which specializes in research for the U.S. Department of Defense, NASA and other Government agencies. The Space Telescope Science Institute is located on the Homewood campus and controls, analyzes, and collects data from the Hubble Space Telescope. 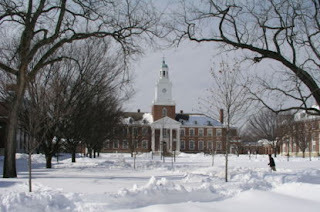 At the collegiate level, in its annual National Universities ranking U.S. News placed The Johns Hopkins University 14th (tied with Brown University and Northwestern University) for 2008,up from 16th in 2007. Hopkins ranked 8th in that publication's peer assessment category this year, and is also one of a select group of universities to have ever been top 10 in the nation overall. Meanwhile, comprehensively, the 2007 Academic Ranking of World Universities, popularized by The Economist and produced by Shanghai Jiao Tong University’s Institute of Higher Education, ranked Johns Hopkins 19th amongst universities globally in terms of quality of scientific research leading towards numerous awards. Further, in the annual rankings by the The Times Higher Education Supplement, based on a subjective peer review by scholars, Hopkins placed 10th nationally and 15th worldwide.. Finally, in its 2007 evaluation of universities on the dual basis of distinction in research and international diversity, Newsweek ranked the Johns Hopkins University 15th worldwide.